This Friday released Hindi offerings Firangi and Tera Intezaar have opened to a slow note as expected and also getting unfavorable response from most of the critics as well as audience. Like several previous weeks, this one too is not much good for the Bollywood industry. 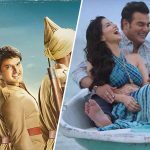 Stand-up comedian turned action-producer Kapil Sharma’s second film Firangi after 2 years of his debut Kis Kisko Pyaar Karoon, has released this week with lower hype than it should have. Due to weak execution, it got failed to impress viewers and registered the business of 2.10 crores. Despite the weekend and the face value of Kapil, on Saturday Rajiev Dhingra’s directorial witnessed drop in footfalls and minted the amount of 2 crores. With this, it’s 2 days total collection has become 4.10 crores at domestic box office from 1150 screens across the country. On the other hand, Bollywood’s baby doll Sunny Leone and Arbaaz Khan starrer romantic drama Tera Intezaar is as expected struggling at box office to gather audience in theaters. Also it is getting negative remarks from viewers. On the opening day, Raajeev Walia’s directorial took poor start and did the business of only 0.50 crore. While on the next day, due to weekend it reported slight drop and raked the business of 0.45 crore. With this, Tera Intezaar raised it’s 2 days total collection to 0.95 crore domestically. Vidya Balan starrer Tumhari Sulu that was released couple of weeks back, still has enough hold over the audience and getting better response than Tera Intezaar.